Mary Ellen Smoot was the thirteenth General President of the Relief Society, the official auxiliary of The Church of Jesus Christ of Latter-day Saints, often inadvertently called the Mormon Church. She served from 1997 to 2002. She was born August 19, 1933 in Ogden, Utah. Her parents, Melvin and LaVora Blood Smith Wood, were a Mormon family, descendants of early Mormon pioneers. Mormon is a nickname sometimes used to describe members of The Church of Jesus Christ of Latter-day Saints. Her parents taught their six daughters to live the gospel and to work hard. They, with the help of their children, grew their own food and raised animals. She also worked in her grandfather’s canning factory. She developed a strong love of genealogy and authored several books on the subject. As a teenager, she became involved in student government and held a number of volunteer church positions, which gave her experience in leadership. When she and her family attended a local Mormon conference, Harold B. Lee, a future Mormon prophet, was presiding. He invited her to come forward without warning to share her testimony of the gospel of Jesus Christ. She met her husband, Stanley Millard Smoot, while in her freshman year of high school. He served a Mormon mission in Hawaii as a young adult, and when he returned, they married. Together, they raised seven children and also took in five foster children. While raising this large family, she managed to be involved in a wide range of activities. She served as the president of the PTA, an American organization made up of parents who work to improve the schools their children attend. She headed the Centerville (Utah) Women’s Republican Club. She also hosted a radio program for teenagers. 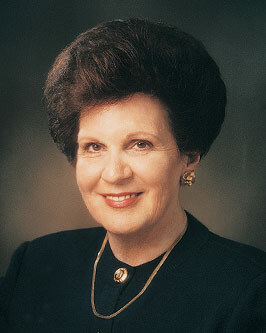 From 1966 to 1971 Mary Ellen Smoot served on the editorial board for a Mormon children’s magazine, The Children’s Friend. She and her husband both served on Church public affairs committees and also directed the Church Hosting for VIPS program from 1993 to1997. During her tenure as General Relief Society President, she spearheaded a project that resulted in providing 350,000 homemade quilts for Kosovo refugees, 50,000 more than had been requested. This allowed The Church of Jesus Christ to ship additional quilts to other countries with great need. Mary Ellen Smoot was the keynote speaker at the second World Congress on Families in Rome, Italy, in 1999. She often encouraged women to develop inner strength, to find the good in whatever life they were living, and to become everything they were capable of becoming. This page was last edited on 29 September 2015, at 18:50.